Had my consult with Emily and loved her! She was so honest with my expectations and went above and beyond considering the health of my hair and explaining home care. I’m excited to get my hair done. Also loved the decor and atmosphere of the salon! Emily interviewed in 2014 and was hired by Gemy instantly. Future salon growth would cause her to be Gemy’s last full-time floor assistant. She worked side by side at a fast pace while doing specialized services while double booked. By example she learned you can still have a a personal touch while managing a full clientele. Emily would be successful regardless, but this experience helped confidently develop her own behind the chair style. She now has a growing clientele she services with organized grace. She continues the salon’s passion of mentoring by helping train assistants. 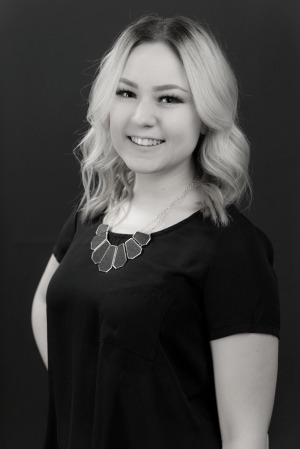 She is an expert at Studio 39 color theory and has received extensive training in balayage, cut and color work and is passionate about continuing education. She has attended Sam Villa and other advanced cutting classes. Showcasing her skill set early on the salon floor caused her to quickly become a highly requested stylist who has evolved into an advanced colorist and specialized hair extensionist. She has a romantic feminine style that resonates in her work. Her talent in balayage, blonde, and vivid color work is both artistic and expertly finished. As the salon continues growth, Emily has naturally stepped into more leadership on the salon floor as an accomplished colorist. She carefully plans her corrective and blonde work. In cutting she loves trendy bob styles and cutting very long hair to short hair. Where some stylists would be intimidated by major transformations, she enjoys the challenge. She is a certified Babe hair extension stylist and was specifically trained by Gemy to continue the salons knowledge of I-tip, micro link hair extensions. She is a great listener and gives thoughtful input to salon guests concerns. She then creates a customized look for personalized style. Her kind demeanor and sweet approach are always noticed by Salon guests. A true artist, this talented stylist is also an accomplished musician. Outside of work she and enjoys spending time with her sister Bridget, salon friends and her boyfriend Anthony. She is also a doting mother to their fur babies.